A new study published by an international research team from the Scripps Research Institute has tracked the roots of the Lassa virus and reveals how it has evolved over the centuries. The task was accomplished with a variant form of genome sequencing called next-generation sequencing. The researchers isolated virus samples from both humans and Mastomy natalensis, the African soft-furred rat. The rats are a natural reservoir for Lassa fever; most cases of Lassa in humans result from exposure to the rodent’s infected urine or droppings. Using the genome sequencing of various strains of Lassa found across the world, researchers were able to trace the virus to a common ancestor that existed 1,000 years ago in what is present-day Nigeria. The age was somewhat surprising, as Lassa fever was only identified in 1969. Around 400 years ago, the Lassa virus left Nigeria and spread to the areas that are now Liberia, Guinea, and Sierra Leone. These are the regions currently experiencing an Ebola outbreak, which is not entirely coincidental. Lassa is a relative of the Ebola virus, albeit one that has lower mortality and transmission rates. One of the largest differences between the two is that Lassa is harder to transmit from person-to-person, relying mostly on “spillover” from endemic animal levels. There is no vaccine for Lassa fever and the only effective treatments need to be administered early on. The research team hopes that their findings, which include information on how the virus has evolved, can be used to better craft treatments that take into account how the disease mutates while inside a host. For 80% of patients with Lassa fever, the symptoms are mild and can easily go undiagnosed. 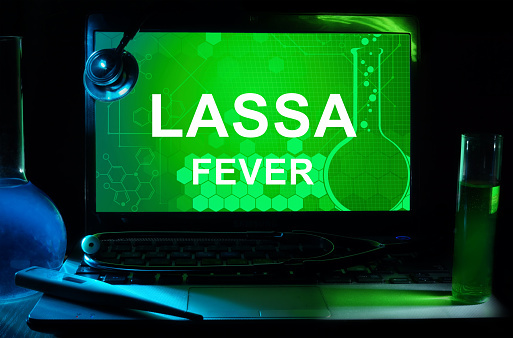 Symptoms of Lassa fever include weariness and general weakness, fever, and headache. For the remaining 20% who experience more serious cases, symptoms include pain in the chest, back, and abdomen; facial swelling; hemorrhaging; and shock. Several neurological symptoms such as tremors, encephalitis (inflammation of the brain), and hearing loss can also occur. Death from Lassa fever is usually the result of multi-organ failure. An estimated 10%–16% of hospital admissions in West Africa are attributed to Lassa fever. Approximately 100,000–300,000 cases are reported each year, with about 5,000 ending in death. Anderson, K.G., et al., “Clinical Sequencing Uncovers Origins and Evolution of Lassa Virus,” Cell 2015; 162(4): 738–50, doi:http://dx.doi.org/10.1016/j.cell.2015.07.020. “Researchers Develop New Genomic Data Set on Lassa Virus,” News-Medical.net web site, August 14, 2015; http://www.news-medical.net/news/20150814/Researchers-develop-new-genomic-data-set-on-Lassa-virus.aspx. Venosa, A., “Origins Of Ancient Disease Could Help Develop Vaccines We Need Right Now,” Medical Daily web site, August 13, 2015; http://www.medicaldaily.com/scientists-discover-ancient-origin-lassa-virus-cousin-ebola-info-may-help-develop-347724.